Nov 10 soybeans closed at USD12.73 1/2, up 8 3/4 cents; Dec 10 soybean meal closed at USD348.00, down USD0.20; Dec 10 soybean oil closed at 52.22, up 97 points. Beans advanced 48c on the week, with meal up USD10.30 and oil almost 300 points higher. Veg oils and soybeans were up sharply in China overnight, propelling beans to a 17 month high and oil to a 26 month high. Food price inflation fears are what seems to be driving the market at the moment. The USDA are out on Tuesday with their November WASDE and US production and stocks numbers. Ending stocks are expected to decline slightly from last months 265 million bushels to 243 million and production to increase slightly to 3.426 billion from USDAs October number of 3.408. Dec 10 corn closed at USD5.87 3/4, down 2 1/4 cents; Mar 11 Corn closed at U*SD6.01 3/4, down 2 cents. Dec corn closed just 5 3/4c higher on the week, although it did post a contract high on Thursday. Pre-weekend profit taking along with a slightly stronger dollar led corn to post modest losses. There was also probably an element of book squaring ahead of Tuesday's USDA report. Analysts are looking for ending stocks to decline to 845 million bushels from 902 million in the last report. Average trade guess for production is 12.542 billion bushels compared to the USDA October number of 12.664 billion bushels. Yields are seen falling from 155.8 bpa to around 154.6 bpa. Dec 10 CBOT wheat closed at USD7.28 3/4, up 15 cents; Dec 10 KCBT wheat closed at USD7.86, up 17 cents; Dec 10 MGEX Wheat closed at USD7.97, up 12 1/4 cents. 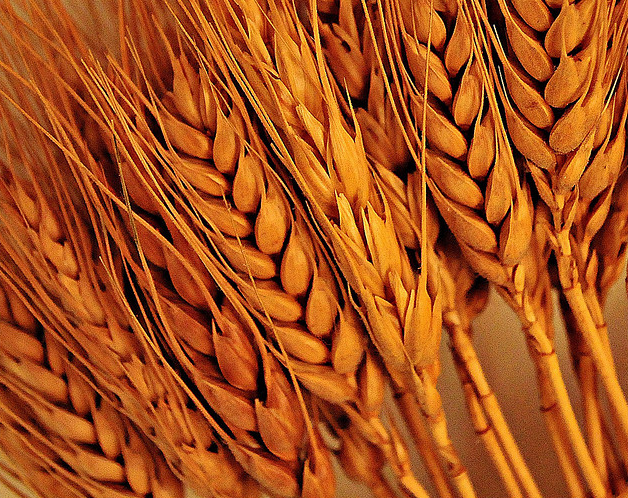 Wheat ranged from 11 to 20 cents higher on the week. Prices jumped higher in the last half hour of trade to close at their best levels since September. Tuesday's USDA report is not expected to be as important for wheat as it is for corn and soybeans. A small ending stocks increase if actually being forecast, to 855 million bushels from 853 last month. Production numbers from around the world will carry more importance, especially with regards to Argentina and Australia. 05/11/10 -- Nov10 London wheat closed with modest GBP0.20 gains at GBP169.00/tonne, whilst Nov11 was unchanged at GBP146.00/tonne. Paris wheat finished with Nov10 up EUR4.75 to EUR225.25/tonne and Nov11 rose EUR1.00 lower to EUR198.25/tonne. 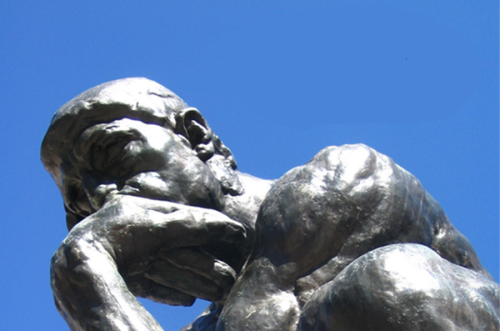 I think that most traders will be glad to see the weekend and reconvene next week, regrouping after we have the latest USDA WASDE numbers to hand. Lower US corn production estimates are what everyone seems to be expecting. The Linn Group estimated corn yields at 154.1 bushels per acre yesterday, down from their 158.2 bpa October number and below 155.8 bpa from the USDA last month. Exactly how much these lower estimates are already factored into the market is what we don't know. US corn exports are tailing off at current price levels. So too are EU wheat exports. Although Brussels issued 196,000 MT of soft wheat export licences this week, there has been a developing trend in recent weeks to show that the rapid early export pace has eroded quite sharply. Last week we had export licences of 389,000 MT and the previous week it was 621,000 MT. Legitimate concerns remain over US winter wheat prospects where the crop has got off to a very poor start, particularly in the top-producing state of Kansas. The trade is relying on a decent US crop in 2011 to make up for a likely continued shortage of cheap Russian wheat. Lower winter wheat plantings, and an acute shortage of carryover stocks at the end of the current 2010/11 season, already look set to hamper Russia's export prospects in 2011/12. 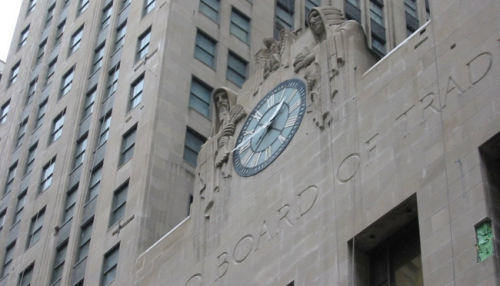 Early Call On CBOT: Fireworks Tonight? 05/11/10 -- It's Bonfire Night here in the UK, but will we see any fireworks in Chicago to end the week? At the moment it looks unlikely, with the overnight grains closing with beans 3-4c firmer, wheat 3-4c lower and corn 4-5c easier. Beans are certainly the strongest leg of the complex this week, despite the USDA being potentially in line to increase their production estimate for US soybeans a little on Tuesday. 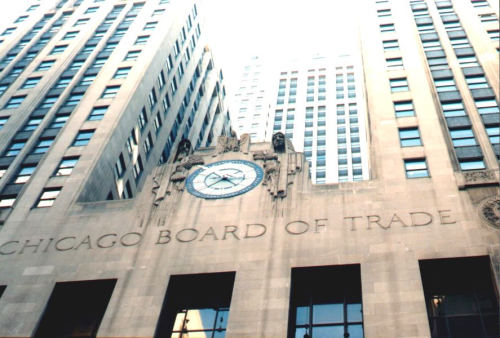 For the week so far we see: Dec CBOT wheat down 2 1/2 cents; Dec corn up 8 cents; Jan soybeans up 38 3/4 cents. Corn could get another shot in the arm on Tuesday with yields and production likely getting revised lower, but for now current prices seem to be rationing demand following another fairly poor set of export sales from the USDA yesterday. We've not had a weekly export sales total above 1 MMT for corn for twenty weeks, yet soybeans have been above that volume for six of the last seven weeks, and the week it didn't manage it it wasn't by much. CBOT beans are now targeting breaking through USD13/bushel, with January hitting a more than two year high of USD12.90 overnight before a small reversal in the dollar's fortunes led to a mini pre-weekend sell-off. Crude oil is now hovering around USD87/barrel having set a two year high earlier today, whilst coffee, palm oil, gold, sugar, rubber and copper are all posting historic gains of their own. Some fairly positive US jobs numbers this afternoon seem to have stemmed the dollar's decline following the Fed's QE announcement on Wednesday. Beans are forecast to open higher, with wheat and corn lower. There may also be an element of profit-taking ahead of the weekend and Tuesday's USDA reports. Decent weekend rains are also in the forecast for Brazil and Argentina, which may encourage some further money to be taken off the table. US weather remains a concern for winter wheat where La Nina is a known drought producer in the Southern United States. Early calls: Beans up 3-4 cents, corn down 4-6 cents, and wheat down 4-6 cents. 05/11/10 -- London sugar futures have hit an all-time high this morning, with New York sugar trading at a thirty year high. Malaysian palm oil surged to fresh more than two-year highs overnight too, breaching 3,200 ringgit, sending the overnight Globex soyoil market also up sharply to a multi-year high. It all seems to be dollar related, and China have joined other countries overnight criticising the Fed's decision to pump USD600 billion of freshly printed money into the US economy. Printing money you haven't got causes inflation, ask Robert Mugabe if you don't believe me. But when the country doing the printing is the US, in who's currency just about everything around the word from corn to cement is priced, it must have an inflationary knock-on effect globally too surely? The world marketplace seems to think so, and a severe bout of inflation jitters has got the world and his wife buying commodities to inflation-proof themselves. Have you spotted the trend yet? 05/11/10 -- We keep reading about it being too dry in the West and too wet in the East, so I guess it should come as no huge surprise to hear that things are just corker in that bit in the middle. South Australia they imaginatively call it, the state where the locals are affectionately known as crow eaters. They'll probably be as cross as a frog in a sock reading this, if any of them could read that is, but I am reliably informed that they can't so we'll press on. 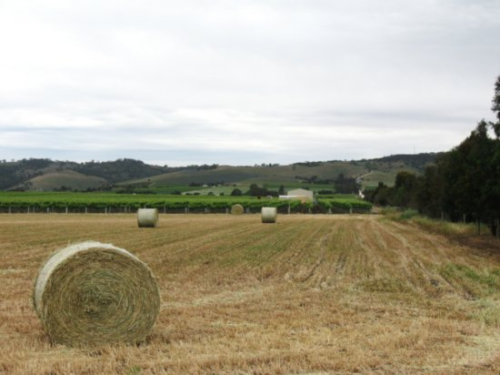 Wheat growers in the state will be tempted to hit the turps on the back of a bin-busting 5.4 MMT crop this season, up 35% on last year and almost double the state's five year average of 2.76 MMT. "Timely rainfall during September and October, together with ongoing cool to mild temperatures, enabled crops to grow in near ideal conditions. 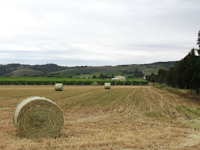 Crops are generally in excellent condition and continue to ripen relatively slowly in the absence of any sustained hot weather, with harvesting to start later than normal and extend over a long period." says the state's November Crop and Pasture Report. Bonzer! 05/11/10 -- You could be forgiven for having taken your eyes off the price of crude oil lately, given all the turmoil in our own markets. It's been creeping up steadily, currently residing at a two year high of around USD87/barrel and seemingly eyeing a test of USD90/barrel. The Fed's new round of QE, and the ensuing dollar weakness, has provided oil futures with some further upside impetus. An improving outlook for the global economy, and the implications for oil demand are also behind the move. Breaking through USD90/barrel might be more pivotal than you may think. A break through that mark would actually mean that we'd be closer to the infamous mid-2008 USD147/barrel top of the market than the late 2008 low of under USD33/barrel. 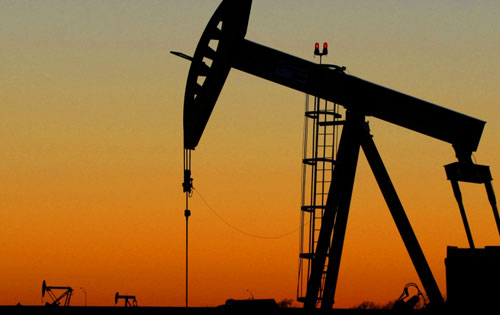 The fall out from the credit crisis, and new tighter US legislation relating to new drilling in the aftermath of the BP oil spill may soon start to alter the global supply and demand dynamics for crude oil. It may be that USD147/barrel looks cheap inside a couple of years. Nov 10 soybeans closed at USD12.64 3/4, up 37 1/4 cents; Dec 10 soybean meal closed at USD348.20, up USD9.30; Dec 10 soybean oil closed at 51.25, up 135 points. Weekly export sales were strong again at 1,586,200 MT for 2010/11 and 30,000 MT for 2011/12 delivery. China was the biggest buyer at 927,100 MT for 2010/11 delivery. The Fed's decision to pour another USD600 billion into the US economy was seen as supportive for commodities all round. Dec 10 corn closed at USD5.90, up 9 cents; Mar 11 Corn closed at USD6.03 3/4, up 9 1/4 cents. Corn sales were again a bit flat at 461,600 MT and towards the bottom end of expectations. Yet again there were none of the alleged Chinese sales. Shipments were better than the last four week average at 880,300 MT. Next Tuesdays USDA report will peg the US production figure at 12.542 billion bushels, according to the average trade estimate. Dec 10 CBOT wheat closed at USD7.13 3/4, up 23 1/2 cents; Dec 10 KCBT wheat closed at USD7.69, up 22 1/2 cents; Dec 10 MGEX wheat closed at USD7.84 3/4, up 22 1/2 cents. Old crop export sales of 565,600 MT were within trade estimates. Crude oil futures were up more than 2 dollars a barrel which added support. With a strong La Nina in effect, the cards are stacked against a miraculous recovery for wheat in states like Kansas, say Martell Crop Projections. 04/11/10 -- Nov10 London wheat finished GBP1.30 higher at GBP168.80/tonne, with Nov10 Paris wheat up EUR2 to EUR220.50/tonne. 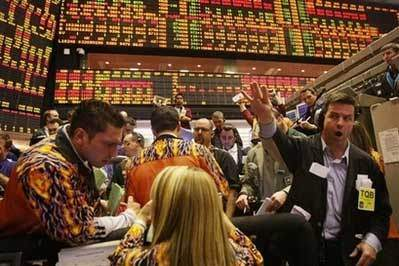 A sharply higher CBOT market spilled over into EU wheat despite an acutely weak US dollar. Brussels released 196,000 MT of soft wheat export licences during the past week. Although that seems to indicate a slowdown, marketing year to date exports are still well ahead of 2009/10 at 8.3 MMT. So there's something for both the bulls and the bears to cling onto there. 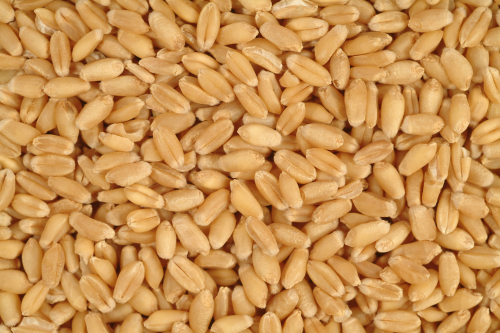 Algeria bought 200,000 MT of optional origin wheat in a tender today. Whilst that was probably French wheat, Egypt's tender earlier in the week indicates that EU origin grain hasn't got things entirely it's own way. The US dollar fell to multi-month lows against both the euro and sterling after the Fed announced a USD600 billion money printing exercise. The Russian Ministry say that they've harvested 43.2 MMT of wheat this year, along with 8.8 MMT of barley this year (both in bunker weight). Strong sales again for soybeans, although they couldn't quite manage to reach the 2 MMT mark as they have for the past two weeks. As ever China was the biggest home booking 927,100 MT, including 102,500 MT switched from unknown destinations. Corn sales were again a bit flat and towards the bottom end of expectations. Yet again there were none of the alleged Chinese sales. Wheat sales were in line with expectations and included 44,000 MT for delivery in 2011/12 for the Philippines. Soybean shipments were 1,965,600 MT, those for corn 880,300 MT and wheat 429,500 MT. 04/11/10 -- The word on the streets is that the Ukraine government hadn't received one bid for any of it's newly introduced export licences as of yesterday morning. Nobody appears to have a clue about exactly what they are bidding for entitles them to. Meanwhile chaos reigns, there certainly appears to be some kind of unofficial ban now on sunflower exports too, and rumours circulate of similar problems on rapeseed. The Russian Ministry say that they've harvested 43.2 MMT of wheat this year, along with 8.8 MMT of barley. The corn harvest is ongoing and has produced 2.7 MMT so far, they say. So too is the sunflower harvest, which has produced 4.7 MMT to date, they add. The Fed announced a USD600 billion QE package last night at the rate of around USD75 billion/month. That has propelled the pound to a nine month high against the dollar this morning, hitting 1.62 for the first time since January. The overnight grains are all sharply higher on the back of the weak dollar, with beans currently around 20-25c higher, wheat up 8-10c and corn up 6-7c. Malaysian palm oil futures have hit a fresh 27 month high overnight in Kuala Lumpur. CBOT Jan soybeans settled 3 1/2c higher at USD12.37 1/2 a bushel; soymeal ended USD1.20 higher at USD338.90; December soyoil closed 27 points higher at 49.90. The Fed said it will pump in around another USD600 billion worth of QE into the US economy. That should keep the dollar weak, and support US commodities in general. Tomorrow brings the USDA's weekly export sales report, they've had two weeks now of sales in excess of 2 MMT. Estimates for tomorrow range 1-1.5 MMT, but another 2 MMT plus week is not out of the question. CBOT Dec corn ended 5 1/4c higher at USD5.81; CBOT Dec corn also closed 5 1/4c higher at USD5.94 1/2. The trade is expecting the USDA to side with Informa and FCStone, who both cut their corn production estimates earlier in the week, when they come out with their November forecasts next Tuesday. Trade estimates for tomorrow's weekly export sales report range around 450-650,000 MT. Steady crude oil, which is now trading around USD85/barrel and nudging towards USD90/barrel, was also supportive. CBOT Dec wheat settled down 4c at USD6.90 1/4; KCBT Dec wheat fell 2c to USD7.46 1/2; MGEX Dec wheat rose 1 1/4c to USD7.64. MGEX climbed on spread activity between the three exchanges with sellers on CBOT and Kansas buying Minneapolis wheat. The Fed announced that they would purchase 600 billion dollars worth of treasuries over the course of the next six months. This is deemed as long term supportive for US grains in general. US weather remains a concern for winter wheat. 03/11/10 -- EU wheat futures closed lower on dollar weakness after US President Obama's Democrats took a pasting in the US mid term elections. Nov10 London wheat closed down GBP2.40 at GBP167.50/tonne and Nov11 London wheat down GBP0.75 to GBP144.50/tonne. Nov10 Paris wheat closed EUR0.50 lower at EUR218.50/tonne and Nov11 Paris wheat was down EUR0.25 to EUR194.25/tonne. It was a quiet session, with the market a little subdued by France's failure to win a larger slice of Egypt's latest wheat tender this week. 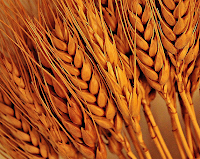 Argentine wheat was priced USD21.50/tonne cheaper than French wheat, affording it the lion's share of the tender despite a significant freight disadvantage. The French Ministry said that the nation produced 35.7 MMT of soft wheat this year compared to 36.4 MMT in 2009. Barley output was 10.1 MMT and corn production 13.6 MMT, they added. Russian winter grain plantings are around 17% down on where they were last year, with little time for further expansion as winter closes in. Spring sowings are expected to at least partially compensate, if they can find sufficient quantities of seed. European wheat generally looks pretty good heading into winter dormancy. 03/11/10 -- Just spent another couple of hours offline due to Virgin Media not sticking to their side of the bargain. 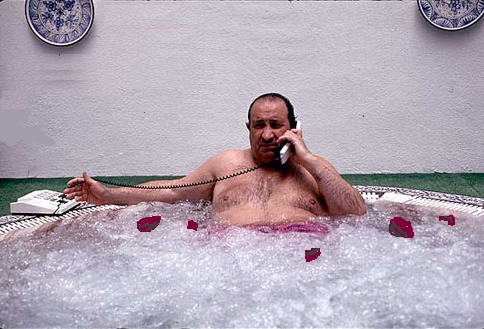 The deal we have seems to involve us prepaying for a service that Virgin may or may not, at their discretion, provide. 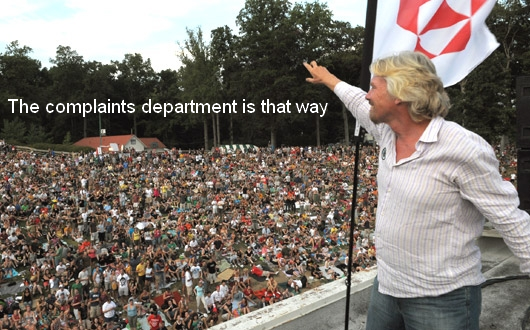 Richard Branson may have left school with only one or two O levels* (depending on who's story you believe - counting clearly wasn't one of them), but he's evidently decided to massage his own ego by choosing to employ only people with none, judged on the service they aren't providing. Not that long ago we had our service inexplicably cut off entirely, just hours after upgrading to the all singing, all dancing V+ package, because the cost of the guy coming out to fit the box took us over the credit limit that we didn't know we had. Now you'd have thought that when we agreed to the upgrade they might have mentioned that wouldn't you? I mean we didn't miss paying a standing order or anything, the cost of installation kicked in around two hours after the bloke left and they just cut us off. Not a phone call or balls all, just silence. You may not be surprised to hear that although they can cut you off just like that without a call, I mean the know the number don't they as they provide it, they can't switch you back on just like that. Oh no. They can only switch you back on, despite acknowledging that you haven't actually done anything wrong, sometime in the next 24 hours. Probably. Today's hiccup was just a couple of enforced offline hours for no apparent reason. And sadly I don't feel like ringing Mumbai to find out what the problem was. So Richard get in your feckin' balloon, or you solar powered bloody space ship and just feck right off to your pissin' private Caribbean eco-friendly time capsule and stay there with your one O level you useless long-haired freak. * For the benefit of younger readers: O levels - what we used to work for at school before the new innovation of giving away GCSE's. 03/11/10 -- To date Russia has planted winter grains on 14.6 million hectares, according to the Ag Ministry. That's around 17% down on this time last year. Kazakhstan meanwhile has wrapped up it's 2010 grain harvest producing a crop of 13.9 MMT, according to it's Ag Ministry. That's a decline of a third on last season's crop of 21 MMT. Even so with sizable carryover stocks from last season the country will still be able to export 7-8 MMT this season, they add. Nov 10 soybeans closed at USD12.23 3/4, down 1 1/2 cents; Dec 10 soybean meal closed at USD337.70, down USD0.10; Dec 10 soybean oil closed at 49.63, down 12 points. The market was seen as taking out some risk ahead of the mid term election results and Wednesday’s Fed meeting. Informa pegged US soybean production at 3.425 billion bushels with a 44.6 bpa yield, up slightly from their last estimate of 3.42 billion bushels. That is also a bit higher than the USDA's Oct estimate of 3.408 billion bushels. Dec 10 corn closed at USD5.75 3/4, down 1 1/2 cents; Mar 11 corn closed at USD5.89 1/4, down 1 1/4 cents. Informa projected a 12.592 billion US crop with a yield of 155 bpa. That was down on a crop of 12.900 last month with yields of 158.7 bpa. It is also a tad lower than the USDA's October estimate of 12.664 billion and yields of 155.8 bpa, but broadly in line with what the market is expecting. CBOT Dec wheat closed down 8 1/4c at USD6.94 1/4; KCBT Dec wheat fell 5 3/4c to USD7.48 1/2; MGEX Dec wheat lost 4c to USD7.62 3/4. US wheat lost out in Egypt's latest tender, with French, Australian and Argentine wheat getting the thumbs up. The USDA announced a sale of 110,000 MT of US HRW wheat to "unknown" destinations. 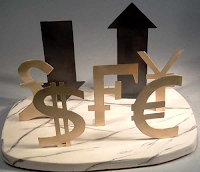 The weak US dollar and declining crop ratings were supportive. 02/11/10 -- Nov10 London wheat closed GBP0.60 lower at GBP169.90/tonne and Nov10 Paris wheat was down EUR3.75 to EUR219.00/tonne. French wheat won a share of, but by no means all of Egypt's wheat tender, reiterating that European wheat - particularly French wheat - doesn't have the market all to itself. The US also got a poke in the eye as they didn't feature at all in today's tender. Indeed, France only got a look in due to it's much closer proximity to Egypt than the other two winning origins - Argentina and Australia. French wheat was priced at USD317.00/tonne, whilst Argentine wheat was USD295.50/tonne and Australian wheat at USD302.30/tonne. Both southern hemisphere countries will be harvesting in full swing in the next few weeks. The continued weakness of the US dollar was also a factor in EU wheat slipping lower on the day. 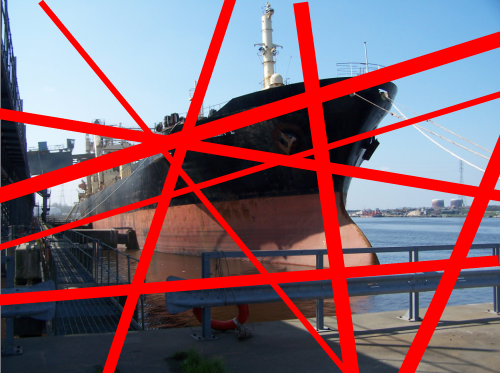 The US may launch the good ship QE2 this week and the market is also nervous over the US mid-term elections. 02/11/10 -- Egypt's state-owned wheat buyer GASC snubbed US wheat in today's tender, buying instead a combination of 230,000 MT of Argentine, Australian and French wheat for January shipment. That's the first time they've bought Argentine wheat in as long as I can remember, and maybe indicates that there's still a bit of competition around for US wheat. Reports out of Argentina suggest that very early wheat yields are extremely promising, with a crop of 12 MMT potentially on the cards. 02/11/10 -- The overnight grains were firmer across the board led by wheat which closed 6-8c higher, corn was 3-4c firmer and beans up 4c. Wheat led after the USDA cut good/excellent crop ratings by 1 point to 46%, with ratings in the top-producing state of Kansas declining 4 points to 38% good/excellent. FCStone released the following US crop production estimates yesterday: Corn 12.523 billion (154.1 bpa), down 140 million from the last USDA; Soybeans 3.449 billion (44.9 bpa), up 41 million from the last USDA. Informa are due out later today, ahead of the USDA's report next Tuesday. Just like FCStone, almost everyone is predicting a smaller corn number again this month. Egypt may buy US wheat this afternoon. US wheat weekly export inspections yesterday were down 31 percent from last week at 16.188 million bushels. Soybean inspections were 60.26 million bushels, which was 10.47 million bushels lower than last week’s number. Corn came in at 25.59 million bushels inspected for export, which was 1.6 million higher than last week. China sold 31% of the corn it offered at this week's government auction. There has still been no confirmation of the widely touted Chinese corn purchases that have supposedly taken place over the last few weeks. The USDA have today however confirmed the sale of 110,000 HRW wheat to "unknown". US weather forecasts on the Great Plains look set to remain dry for the next ten days, which will do little to improve wheat ratings. Early calls for this afternoon's CBOT session: corn and beans up 3-5c, wheat up 8-10c. 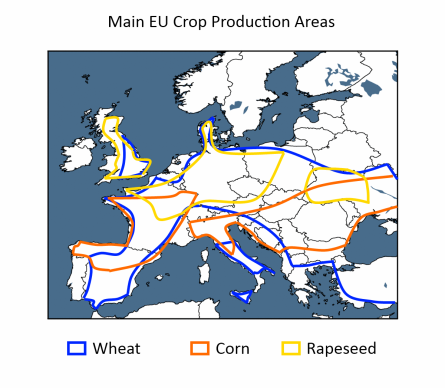 02/11/10 -- The USDA currently estimate that Europe will consume almost 22.7 MMT of rapeseed this season. That's nearly 2.7 MMT more than we have just produced. European rapeseed production has now been lower than domestic consumption of the oilseed in seven out of the last eight seasons. 02/11/10 -- Ukraine's 1 million hectares of winter rapeseed is 98% germinated, according to the Ag Ministry. That's a lot better than this time last year when only 75% made germination after scant autumn rains. They peg 48% of the crop as being in good condition and 38% in satisfactory condition. The USDA surprised the market last night by dropping its wheat good/excellent rating by one point to 46%. Kansas good/excellent was only 38%. La Nina continues to hurt hard wheat on the Plains whilst bringing beneficial moisture to the soft white wheat areas on the Pacific Northwest. Washington good/excellent was 88%. FCStone were out with their 2010 production and yield estimates last night, with their soybean estimates higher and their corn numbers lower than last months USDA figures. Informa are due out with their numbers later today. The HGCA have revised their 2010 Planting Survey results following Defra's revision of the June 2009 survey estimates for England. 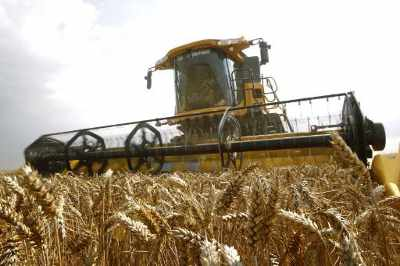 The new figures show a smaller GB wheat area for the 2010 harvest than had earlier been estimated. They now peg 2010 wheat area at 1.95 million hectares, compared to earlier estimates of 1.99 million. Barley and OSR sowings were also revised slightly lower. Full estimates are here. The results of Egypt's latest wheat tender are expected this afternoon. 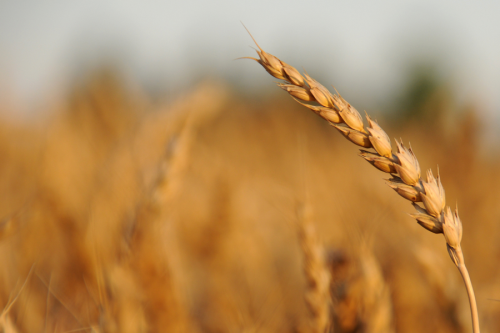 It could be a close call between French and US wheat given recent currency fluctuations. Canadian wheat may also be in with a shout. 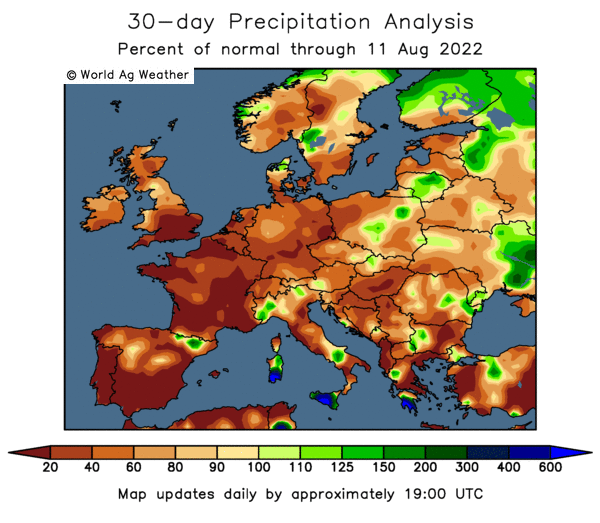 The early summer drought and heatwave followed by a wet finish to the growing season means that only 10.05 MMT of the EU-27 barley crop will make malting standards, according to Strategie Grains. That's a decline of 30% on last season. Nov 10 soybeans closed at USD12.25 1/4, down 3/4 cent; Dec 10 soybean meal closed at USD337.80, up USD0.10; Dec 10 soybean oil closed at 49.75, up 45 points. The USDA’s crop progress report showed soybeans harvested at 96%, up 5 points and 17 points ahead of the 5 year average. The Buenos Aires Grains Exchange report Argentine plantings ahead of normal at 13.5% complete. FC Stone estimates a US soybean yield of 44.9 bpa, 0.5 bpa ahead of the USDA. Dec 10 corn closed at USD5.77 1/4, down 4 3/4 cents; Mar 11 corn closed at USD5.90 1/2, down 4 1/2 cents. FC Stone estimate a US corn yield of 154.1 bpa, 1.7 bpa lower than the USDA’s October number of 155.8 bpa. The USDA’s crop progress report showed corn harvesting at 91% complete, up 8 points from last week and 30 points ahead of the 5 year average. The Buenos Aires Grains Exchange report corn plantings at 69% done, up on last year. Dec 10 CBOT wheat closed at USD7.02 1/2, down 14 3/4 cents; Dec 10 KCBT wheat closed at USD7.54 1/4, down 16 3/4 cents; Dec 10 MGEX wheat closed at USD7.66 3/4, down 10 cents. 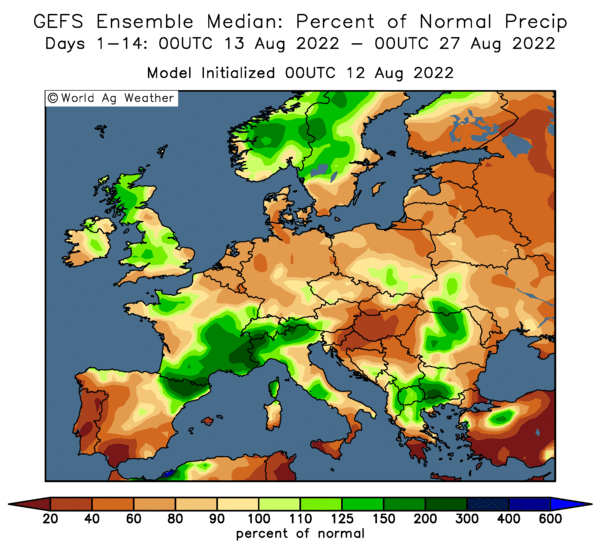 "The next rain event arrives eight days from now for the East, and after a very dry October, the largest winter wheat producing state of all, Kansas, will have to wait two more weeks to see theirs," say QT Weather. USDA’s crop progress report showed winter wheat planted at 92%, good/excellent conditions fell one point to 46%. 01/11/10 -- Nov10 London wheat closed with modest GBP0.25 gains at GBP170.50/tonne, and Nov11 gained GBP0.15 to GBP145.15/tonne. Paris wheat was mostly lower with Nov10 down EUR2.25 to EUR222.75/tonne and Nov11 EUR0.25 lower to EUR196.00/tonne. London wheat did fairly well given the strength of the pound today, which can probably be attributed to a further erosion of the discount that UK wheat remains at over French grain. Although the Paris market was open it was a public holiday in France so volume was light. 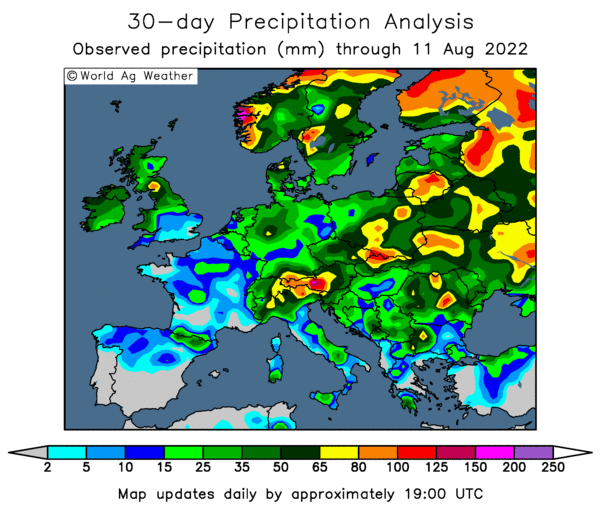 Nothing much has changed, EU exports are still running at a strong pace and there are enough concerns about various wheat crops around the globe to keep end-users nervous. Iraq are in the market for at least 100,000 MT of optional origin wheat and Egypt are also back tendering for at least one cargo of wheat of assorted origins including French/US and Canadian. US markets traded lower throughout the day, despite a weak US dollar ahead of tomorrow's mid-term elections, which capped any European gains. 01/11/10 -- My Ukraine agronomist chum Mike Lee ventured across the border into Russia last week and shot an interesting little video clip of recently planted Russian wheat here. 01/11/10 -- The US dollar is going down the tubes with Barack Obama's Democrats expected to take a pasting in tomorrow's mid-term elections. The "black JFK" is suddenly about as popular as hemorrhoids. The Fed might announce further QE as early as Wednesday, according to some reports, which would likely put the dollar under further pressure. 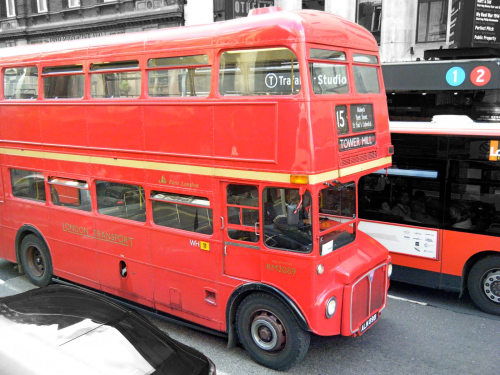 The BoE's MPC and the ECB also meet this week to discuss monetary policy this side of the pond. Nobody is betting on the ECB increasing QE, but there's one or two in favour of doing just that on the MPC. Looks like we could be in for another volatile week on the currency front, with the dollar set to be this week's whipping boy. New month equals new money, at least that's the theory. Certainly with the dollar under pressure the overnight grains have started November in positive mood. FCStone are out this afternoon with their November US crop estimates and Informa are out tomorrow. Corn yields could be further reduced by both ahead of the USDA's numbers next Tuesday. Kuala Lumpur palm oil has hit fresh two year highs overnight as heavy rains continue to lash Indonesia and Malaysia. Iraq are tendering for 100,000 MT of optional origin wheat this week. London wheat has opened on a steady note, with even Nov12 already trading higher. 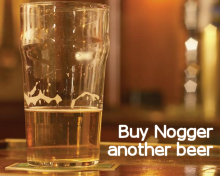 End user interest is starting to pick up even that far forward as buyers eye the substantial discounts that are on offer for not just next season, but also the one after that.